5/16" wide collar is available in 12", 14", 16", 18", and 20" lengths. 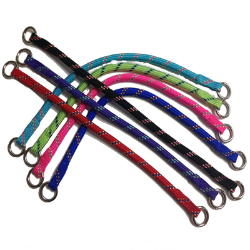 1/2" wide collar is available in 22", 24", and 26" lengths. 5/16" x 12" 5/16" x 14" 5/16" x 16" 5/16" x 18" 5/16" x 20" 1/2" x 22" 1/2" x 24" 1/2" x 26"